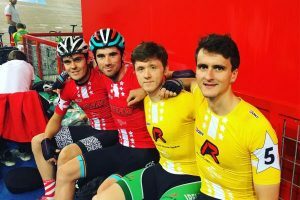 TrackProject.ie is a new and unique Irish international track cycling team launching in 2017. The team has been founded with the primary goal producing Ireland’s first track cycling Olympic medal by the 2020 Tokyo Games. Ambition, perseverance, respect and integrity are the core values that underpin our approach to racing and training. We founded a team to enable us to race by these ideals as a group and to allow supporters who share these beliefs to rally behind us. We want to find partners who share these same values. The team’s founders took inspiration from Ireland’s booming start-up culture and applied the same principles used to create a lean startup in creating a cycling team. The team consists of just 4 riders keeping costs at a minimum and ensuring unity and cohesion in the group. We are funding ourselves through a unique an innovative partnership system that allows individuals or organisations join our cause at a level of investment that they are comfortable with. Although the team is made up of all Irish riders it is going to be based in Mallorca, Spain. This gives the team access to the velodrome in Palma but also the perfect conditions for training on the road. We will be racing a mix of track and road through the Spring and Summer but then our focus through the Winter will be on the track. We have a worldwide racing calendar for 2017 which includes a good combination of world class track races and many of the biggest road races in Ireland.